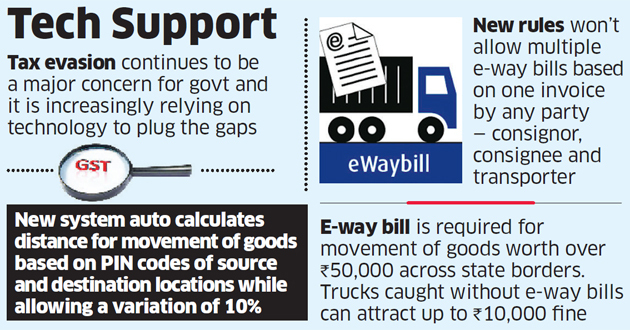 India is eyeing several changes to the electronic-way bill system, ranging from auto calculation of distance for movement of goods to barring businesses from generating multiple e-way bills based on one invoice, as it cracks down on evasion in the goods and services tax (GST) framework. “The recent changes are another example of how the government is relying more on technology to ensure compliances — case in point being auto population of actual distance between supplier and recipient based on PIN codes and automatic blocking of inter-state transaction for small composition dealers,” said Harpreet Singh, partner, indirect taxes, KPMG. The new rules envisage not allowing generation of multiple e-way bills based on one invoice by any party — consignor, consignee and transporter. That is, once e-way bill is generated with an invoice number, then none of the parties — consignor, consignee or transporter — can generate the e-Way bill with the same invoice number .